RVupgrades Blog: Buying A Blue Ox BedSaver From Your RV Parts Supplier Can Save You Money And Prevent Injury. Buying A Blue Ox BedSaver From Your RV Parts Supplier Can Save You Money And Prevent Injury. I still remember the phone call like it was yesterday, about 6 years ago a gentlemen that was difficult to clearly understand was asking about the Blue Ox BedSaver. The product had recently become available and he was interested in purchasing two of them. He then proceeded to tell me how he had just recently got out of the hospital after almost a year of recovery from his fifth wheel trailer becoming unhitched and trapping his head between the trucks bed and the trailer. A quick thinking neighbor ran over, raising the trailer and got help on the way within minutes which saved his life. He wanted to repay the good samaritan with a BedSaver for his trailer and asked if we would tell as many people as possible about his accident so that something like this never happens to another RV'er. Although his life will never be the same do to brain injuries, he was very happy to be alive and thankful to once again go RV'ing. say, "I see this all the time! It always looks the same!" 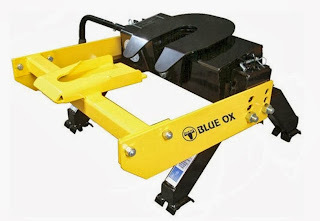 The Blue Ox BedSaver will catch the king pin if it gets detached from the hitch more than likely because it was not engaged properly. It keeps your trailer from dropping onto your truck bed, causing possibly you and for sure your truck considerable damage. It's easy to install and doesn't require any modifications to your hitch. Made of Black Powder Coated steel which is rust resistant each Bed Saver is made specifically for your manufactured hitch. It does not effect how the trailer is hitched in anyway and maintenance is minimal. Blue Ox BedSavers are available for all types of hitches and will spare you the trouble of bed, trailer and even potential bodily harm. Visit our website and find why we are your go-to rv parts supplier. If you have questions feel free to contact us too. We will assist you in making the right part decisions for your RV.